Everything is on video to help you with the installation. Check out our videos or our YouTube Channel. 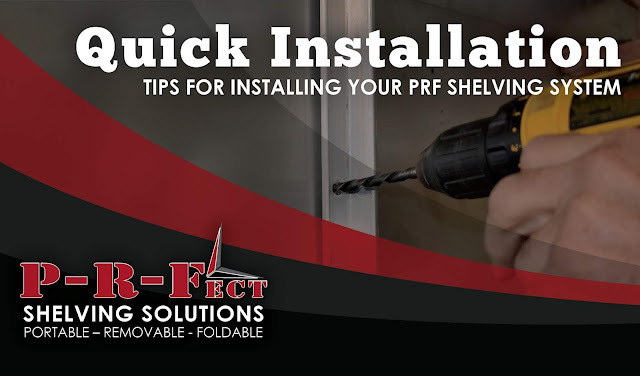 The most important thing to be careful of is to not select too long of screws for the brackets or horizontal rails that the shelves connect to. You might have guessed it, yes - did it. We installed four units in a Fedx contract driver's package delivery truck and inadvertently put two nicely formed holes in the side of the truck. #$@&%*! The rest is easy. Install your rails with the provided hard ware at the needed height so that the sliding brackets hook to the rails. You may have a fender well in the way of a leg. The leg will have to be cut at the height of the fender well using a hack saw or saws-all, but save the cut portion of the leg. An inner coupling, 3/4 X 1/8 square tube, can be used to reconnect the cut portion should you use the system in another application. Just drill holes at the coupling point and use rivets to fix the leg.